An HMT can be used to diagnose small intestinal bacterial overgrowth (SIBO). This is a condition in which abnormally large numbers of bacteria grow in the small intestine which causes excessive fermentation, even in the absence of malabsorption. This can cause symptoms of abdominal pain, bloating, diarrhoea, excessive flatulence and fat in stools. 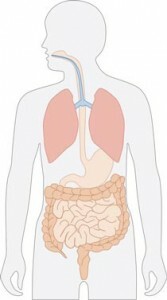 Unlike the large intestine (colon), the small intestine does not usually have a high number of bacteria. When there are too many bacteria in the small intestine, these organisms use up the nutrients that would otherwise be absorbed into the body. A person with small bowel bacterial overgrowth may have compromised nutrition and a damaged intestinal lining. A number of conditions are associated with an increased risk for SIBO. These include: diabetes mellitus, scleroderma, Crohn’s disease, small intestinal diverticular disease, long-term use of acid-suppressing medications, long-term use of strong pain medications, cirrhosis of the liver, excessive alcohol consumption, chronic pancreatitis, pancreatic insufficiency, advanced kidney disease and in those with a prior history of intestinal or colonic surgery. Diagnosis of small bowel bacteria overgrowth is through a Hydrogen & Methane Breath Test and a referral is not necessary. SIBO must be managed under the supervision of a specialist gastroenterologist and ideally with the aid of an Accredited Practising Dietician. Treatment usually involves antibiotic therapy and dietary manipulation to address any nutritional deficiencies that may have developed.